Shocking video footage has emerged showing the moment passers-by refused to help a fatally injured young man who burst into flames while trying to steal copper wire from an electricity substation. 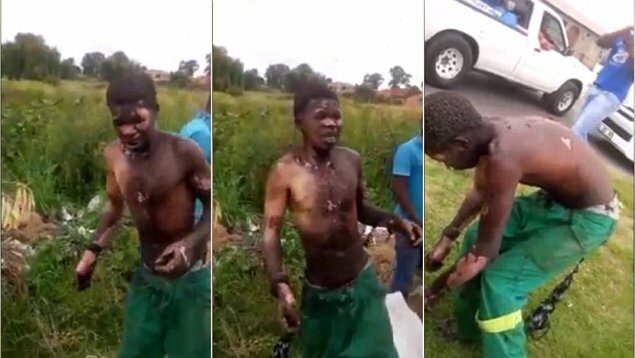 The unidentified South African, who appears to be in his teens, was seen with horrific burns covering most of his upper body following the incident in the outskirts of the city of Witbank in north-western Mpumalanga Province. With his terrible injuries clearly visible, the young man says he is in agony and begs passers-by to take him to the hospital – but he is cruelly told to walk if he wants treatment. The burns victim then walked to a nearby health clinic, where an ambulance was called – but he is understood to have died hours later. The explosive blast was also seen by locals at the same time as the electricity cut out throughout the Witbank suburbs. As they rushed over to see what had happened they saw the man smoking and shouting for help as he climbed out of the Botha substation in the city’s Lynnvill suburb. According to the local council’s acting municipal manager Theo van Vuuren, the thief had probably been attempting to repeat the success of an earlier theft at the same substation. During that incident electrical wiring was stolen leaving the areas of Lynnville and Ackerville without electricity. ‘Today a thief attempted to steal and vandalise Botha substation, only weeks ago this same substation was hit leaving Lynnville and Ackerville without electricity,’ van Vuuren said. He did not comment on the video footage of the young thief that appeared a short while later showing people refusing to assist the man as he screamed in pain and shouted for help. Several community members came out to see why he was shouting but no one wanted to help the poor man. They were all staring at him,’ he added. ‘I am burning, I am dying and it is so painful, please get an ambulance,’ the horrifically injured thief shouted back. According to the source, the man walked 500 metres to the clinic where the nursing staff called an ambulance. He was taken to a nearby hospital but is understood to have died the next day. The local police spokesperson colonel Leonard Hlathi said that they had not had any reports about the theft and the dead man’s identity remains unknown.